I left for the United States a few days ago. Firstly the flight went from Larnaca in Cyprus to Vienna Austria, then a another flight to Washington DC, then a domestic flight to Raleigh / Durham airport in North Carolina. I must thank Austrian airlines for their assistance during this trip. I called them more than a week before departure as I had fractured my right leg in Cyprus on the rocks, they allocated a wheel chair and a great seat for the flight to Washington. Thank you. No help was available to me in the United States by way of a wheel chair. In Washington, there seemed to be an organisational breakdown in the Customs area, initially there was only one customs and immigration officer, who was allocated to United States citizens and none for anyone else. After a while he started seeing to us as well. Then over 30 minutes later another officer arrived and we all started to be processed. Out of the hall into the baggage claim and trying to find our bags, due to the delayed clearance I found my suitcase in a small collection of those that remained. Then we handed them to I guess the domestic people for inclusion in the local baggage service and off I went to find my gate for the flight to Raleigh / Durham in North Carolina. Arriving in Durham, there was a very long walk to baggage claim, then I was picked up by my friend Sandy. 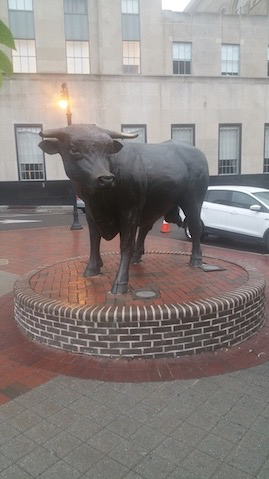 As it was still light, a tour around Durham followed … the city of Durham, where the movie Bull Durham was shot is the home of Duke University and a population of approxiately 250,000 people. Duke University and North Carolina Central University, are a part of the research triangle – including North Carolina State University and The University of North Carolina at Chapel Hill. We later went out to dinner to the Pizzeria Toro in Durham (wood fired Pizza) .. although the smells were enticing and the staff reasonably attentive, the wine enjoyable, however over 30% of the Pizza was badly burnt and inedible … something the staff didn’t get upset about, nor do something about replacing it or at least some of it, strangely. 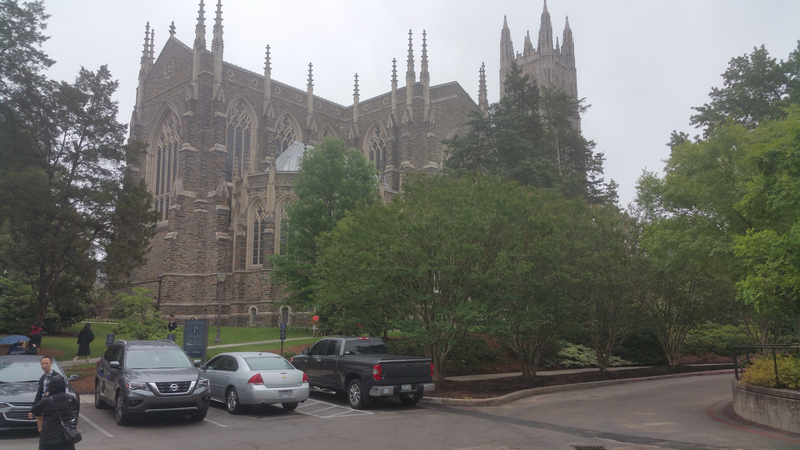 My initial observation is that Durham is incredibly green, moist and that plant life is fecund, there was a livability to it, a quality of life … I could live there, it had a good Bus service evident and in operation, a day pass is $2 – as well all the buses I went on were equipped with Wi-Fi. I left Durham yesterday and decided to travel by train to Tampa … I found it to be a civilised way of travelling, though I can understand because of the time it takes why in this society where unreasoning speed is so valued it is not as popular as it once was. Currently I am in Tampa … its nice a warm here in Florida, going to have a look around shortly. Thanks for the update Bro, sounds like a real adventure ! Sent from Smartphone, not from Office.